Facts about your baby's vision. Newborns only see 12 to 18 inches By 3 months, vision improves to 2 to 3 feet, Suh says. Since the ability to distinguish colors develops over time as well, high-contrast patterns, such as black-and-white images, are most appealing to infants. First-year milestones include: studying up-close faces, 1 month; making eye contact, 2 months; tracking movement, 3 months; spotting small objects nearby, 5 months; and recognizing objects across a room, 8 months. Eye crossing is common early on Newborns' eye muscles are not well-coordinated, but if misalignment continues past 3 months of age, seek an evaluation by a pediatric ophthalmologist, Suh advises. Tear ducts get blocked easily This results in yellowish blobs in the corners of your infant's eyes. The condition usually clears up on its own by 9 to 12 months; in the meantime, gently massage the inner corner of the eye with a warm washcloth two or three times a day. Eye color typically darkens "By age 1, it's probably safe to declare an 'official' eye color," says Suh. 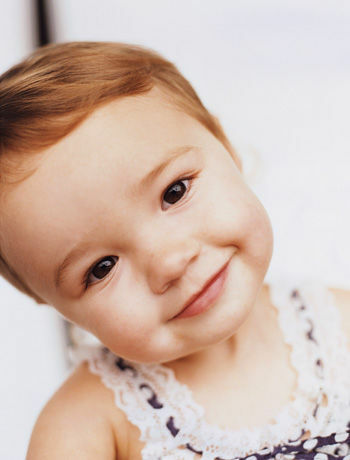 And while your little one may appear to have "your" baby blues, eye color, like fingerprints, is unique.